I never really made the connection between new housing development, mining and the environmental impacts that both have on the earth. 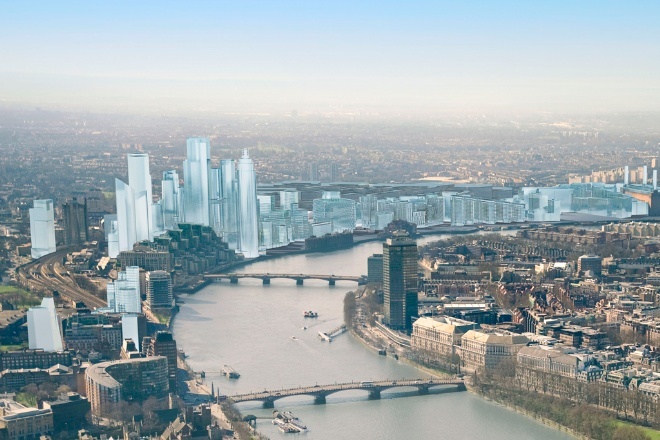 A visualisation of the future skyline of the Nine Elms area of the South Bank in west London has been unveiled by the Nine Elms Vauxhall Partnership. I didn’t know much about zinc, most commonly found with nickel and lead (another staple of the construction industry), I found more than I ever wanted to know from the Australian government — where zinc mining is big business. A large part of the world’s zinc is used as protective galvanised coatings for iron and steel. In Australia, this use accounts for well over half of the domestic sales of zinc. The widespread use of zinc as a protective coating is mainly because of its resistance to normal weathering, and the protection given to steel by the preferential corrosion of zinc when the underlying iron or steel is exposed. The flotation process is then used to separate the zinc and other valuable sulphide minerals from the waste rock particles or tailings to form a concentrate….Electrolysis and smelting are the two processes used to produce zinc metal in Australia. The electrolytic process is … where zinc concentrate from various Australian mines is roasted to eliminate most of the sulphur as sulphur dioxide and make impure zinc oxide. The roasted concentrate is then leached with sulphuric acid to form zinc sulphate solution…The smelting process …. Zinc and lead concentrates from various mines are blended and sintered or partly melted to combine the fine particles into lumps and remove some sulphur as sulphur dioxide. The sintered product is mixed with coke and smelted in a blast furnace to produce zinc vapour (gas), which is condensed by cooling with a spray of molten lead to form impure molten zinc metal (98.3% zinc). To remove the small amount of lead and cadmium impurities the liquid zinc is twice boiled to zinc vapour and recondensed to produce high purity zinc metal (up to 99.95%). My family’s fortunes were tied to mining (my dad made the most wonderful maps, and we helped him) — a terrible thing, being mostly a life of poverty and uncertainty. 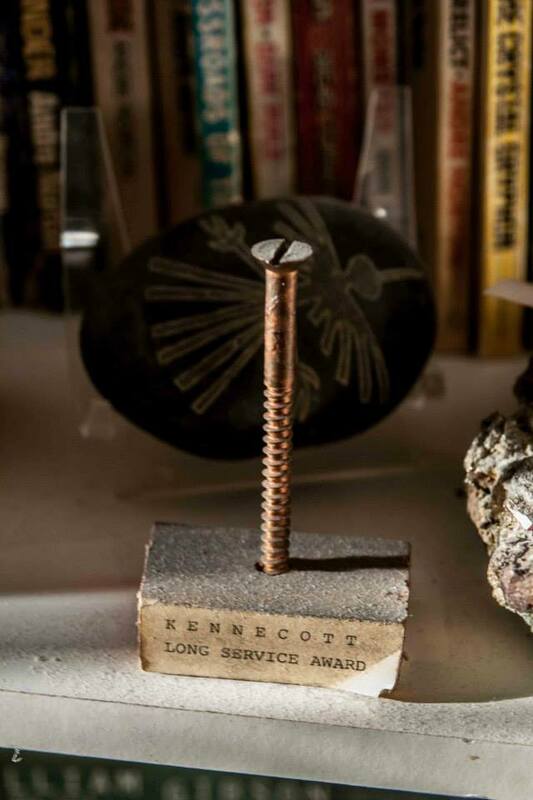 This is what my dad got from his coworkers when finally laid off by Kennecott after refusing to move to Reno. The golden screw. Mining provides a livelihood for many, a job that is dangerous but also one of pride, and a love of working underground. In my own part of the world, their history has been based on land stolen by force from Native Americans, the low level violence of prospectors and high level violence of powerful owners running towns, decimating organising work (and often killing or exiling union organisers), discriminating against non-whites. It has meant a boom and bust cycle that has built towns, then destroyed them. Similar violence, greed and exploitation has been repeated in mines worldwide. Pit mining unquestionably destroys the environment, creating the vast, desolate, toxic and terribly beautiful landscapes shown in the pictures above. All this to build homes on the other side of the country, the other side of the world that will mostly sit empty. Towering boxes of steel and glass that are the least sustainable kind of architecture in terms of energy use, maintenance. Towering boxes of steel that are used as investments toxic to communities being displaced, and toxic to the people who still live there amidst a largely uninhabited wasteland. This is the feeling on Paddington Basin, along much of the Thames both North and South. In the struggle over mining and environment my dad always said (quoting a bumper sticker prevalent at the time), if it’s not grown it’s mined. We need metals, they are in everything we use. But by god we should mine them as safely as possible, pay the workers well, use minerals and metals responsibly, be working to reduce our use of them more and more, to reuse and recycle, to replace lost jobs through the creation of new jobs in improving our world to make it greener and more sustainable. This is necessary for our survival. Instead we strip the earth to build monuments to greed, as unsustainable as the mining practices that make them possible.